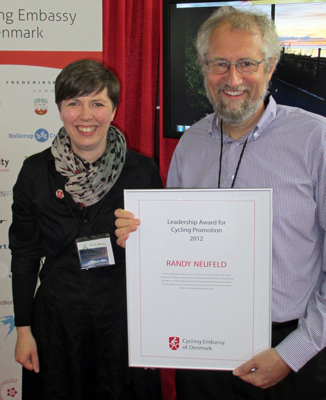 Randy Neufeld blev på den netop afsluttede VeloCity 2012 konference i Vancouver belønnet med den Danske Cykelambassades “Leadership Award” for Cyklingens Fremme. Siden december sidste år har vi samlet nomineringer fra mennesker over hele verden gennem vores nyhedsbrev. Adskillige fremtrædende cykel fortalere er blevet drøftet, men i sidste ende nåede vi frem til at give prisen til Randy Neufeld. Randy Neufeld står i spidsen for SRAM Cykel Fond som donerer penge til alle cykelrelaterede aktivitetet som kan forene cykelindustrien med den moderne cyklist krav og behov. “This year the award goes to a man who has a hands on approach to cycling promotion, and who is always ready to support cycling promotion intiatives. Since the start of his career as a cycling advocate, he has inspired by his example, and has gone from an activist to beeing an extremely influential figure for decision makers shaping transportation policy. His continuous personal and professional devotion to promotion of cycling worldwide from Chicago to Eastern Europe has made him the natural choice for this years award,” said Troels Andersen, Cycling Embassy of Denmark.